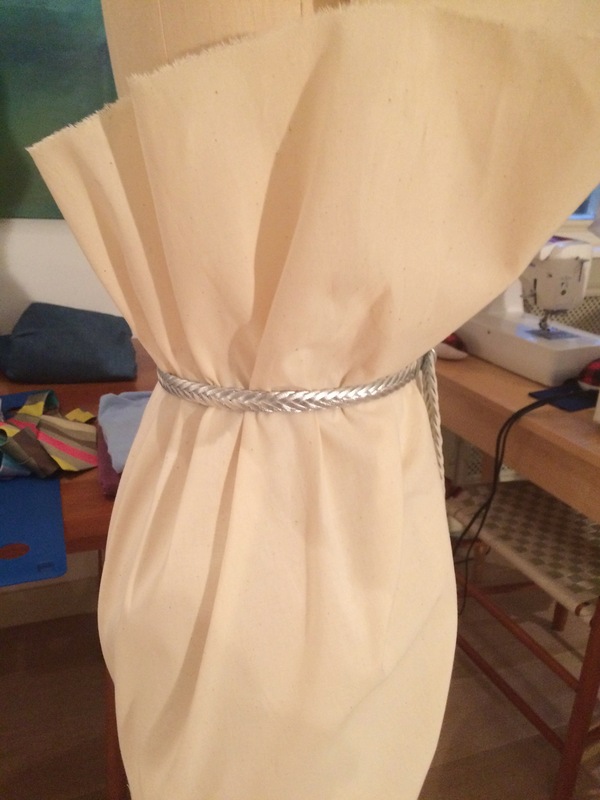 I know I have written quite a lot about my peg skirt experiments, but there is not much information available on the internet about draping a pegged skirt. So if anyone out there wants to try a draped one (as opposed to flat pattern cutting) this post may be useful. I do recognise these posts are not to everyone’s taste, so please feel free to skip it. However I have found this so interesting and I would urge you (if you have a mannequin, or even a friend or relative that you can pin fabric to) to have a go. I am therefore labouring the point a little as some readers are interested in how this works. Despite it’s flaws I enjoy wearing this skirt. I’m with Mary as I was trying to imagine where the side seams should be and being left with some sort of weird poking out edges, Maybe the fabric is just not the right one to be messing with? Would this work with something more drapey and airy? All those pleats and darts are supposed to help you, not create problems. Well my first attempt at pleating a full skirt was very hard work, but I liked the skirt. It is different to the average, run-of-the-mill skirt. I liked the fact it didn’t have side seams like the flat pattern cutting methods. Also I wanted a skirt with structure (while I suspect drapey and airy might be nice too!). I had another go, with calico. Below I explain the process, step by step. It was fun, and it is easy. Doing it this way took no more than 30 minutes. Here is the introduction to the instructions I was given in class. A peg skirt is characterised by fullness at the waist line, which tapers to a narrow hem. Shaping at the waist line can be done with tucks, gathers or unpressed pleats. Stiffer fabrics will accentuate the shape. 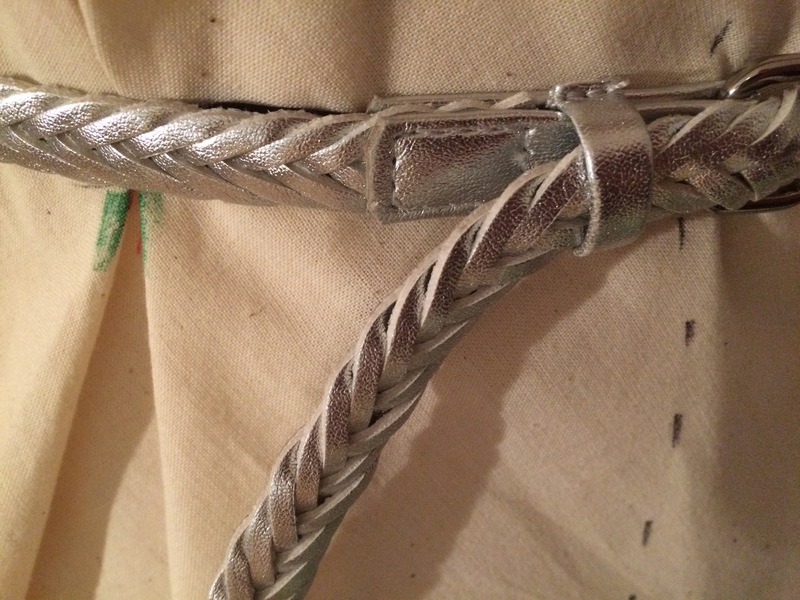 Softer fabrics will fall, creating a more Grecian effect. The peg skirt can be draped with or without a side seam. A side seam is usually used for a more modified silhouette. 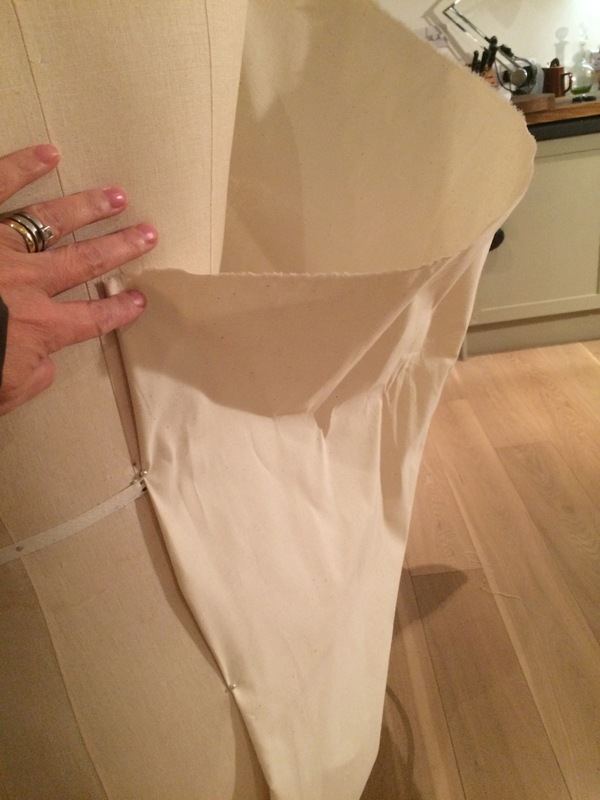 Draping without a side seam allows for more fullness at the waist and therefore a more extreme shape. 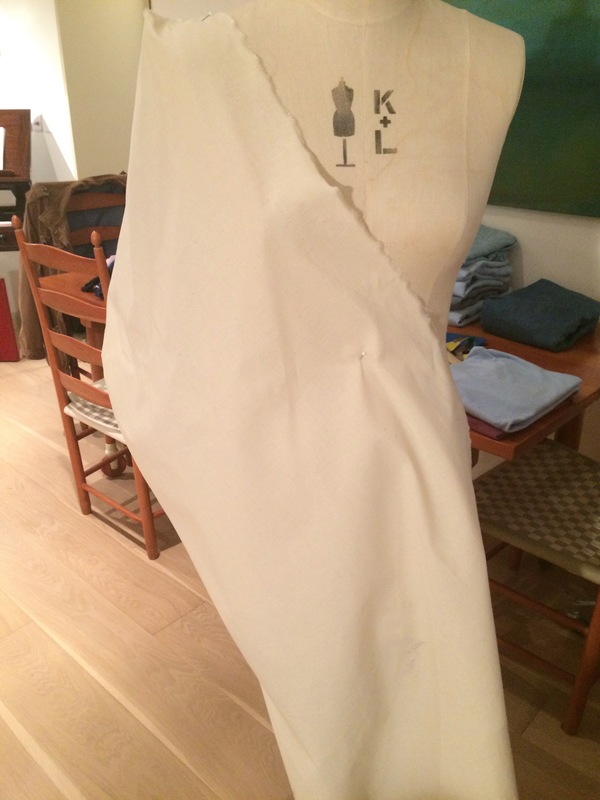 We will be draping without a side seam; the straight grain will be placed along the CB. The steps are (briefly) as follows. 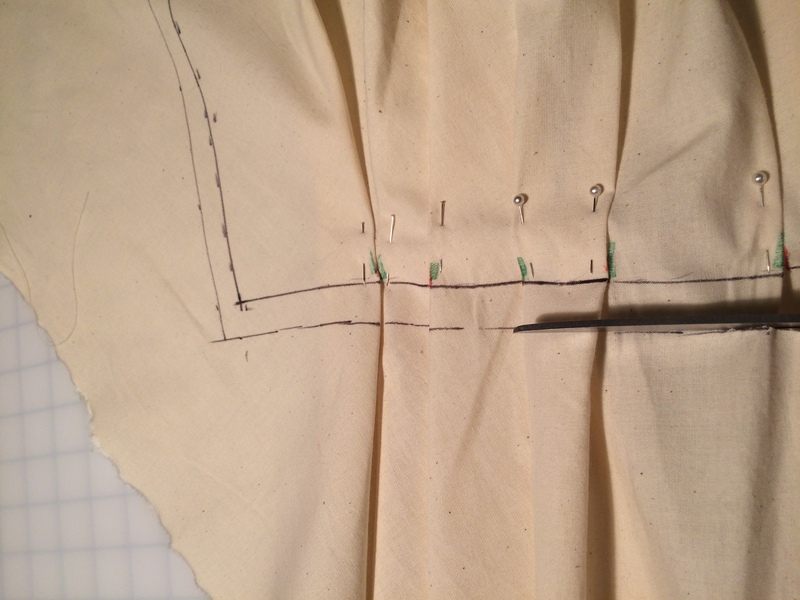 At the CF pull the top edge up, pivoting the hem in towards the body (the CF will be on the bias). This is the crucial and critical step. You can see the edge of the fabric pinned to Camilla’s upper chest. Adjust fullness as required. Fullness can be at CF or CB only, concentrated at the side, or continue more evenly. 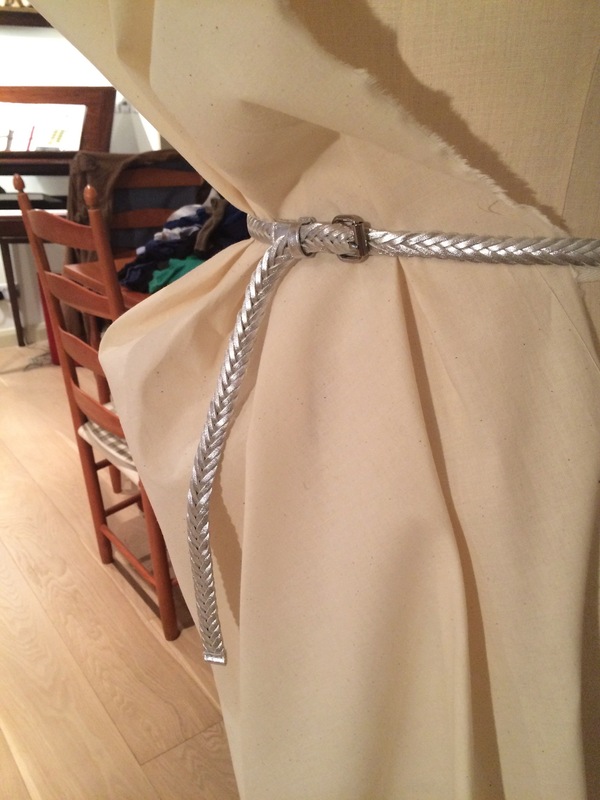 You can create more of a 3D quality to the drape by pulling down more fabric from above the belt (I have illustrated this below, but my pattern will be less exaggerated). Mark the hem from the floor upwards. You can use your calico as a pattern, or create a paper pattern from this. Be sure to measure the circumference of the hem. The one I have draped here is barely 33″. The red skirt has a circumference at the hem of 35″. You may need to include a split at the back. It occurred to me that if I draped this skirt from the CF, instead of the CB, I could then (fabric width permitting) cut the CF on the fold and get back to my one piece skirt, without the attendant problems, reported earlier, about symmetry and fit. Ooooooo you have used my all time favourite The Peg. Your picture looks fantastic and the shape is so beautiful. Another winner. I find these posts very interesting, thank you. I’ll have a go, for the experience, less likely to actually wear it though. You look great in your red skirt. Enjoying these posts – carry on please! The calico looks promising. 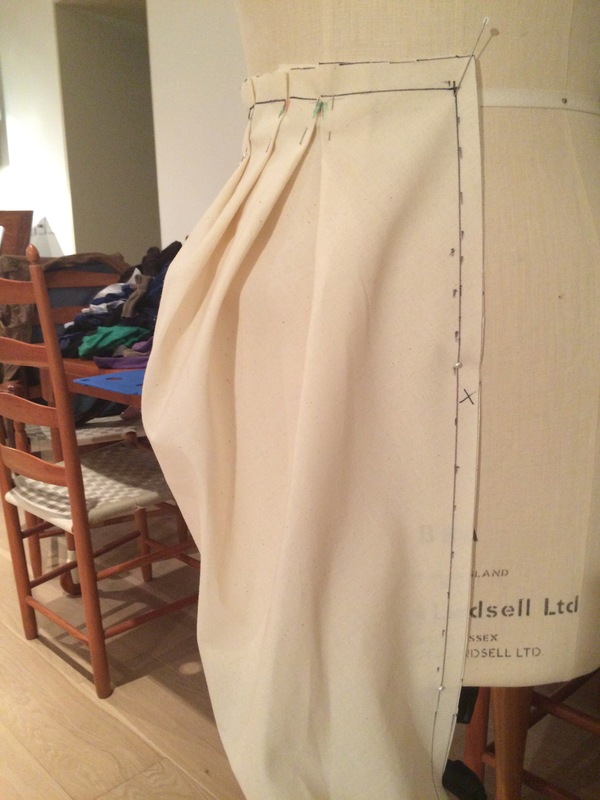 One passing thought, if the CB is on straight grain that might minimise problems with the skirt ‘seating’ in wear. 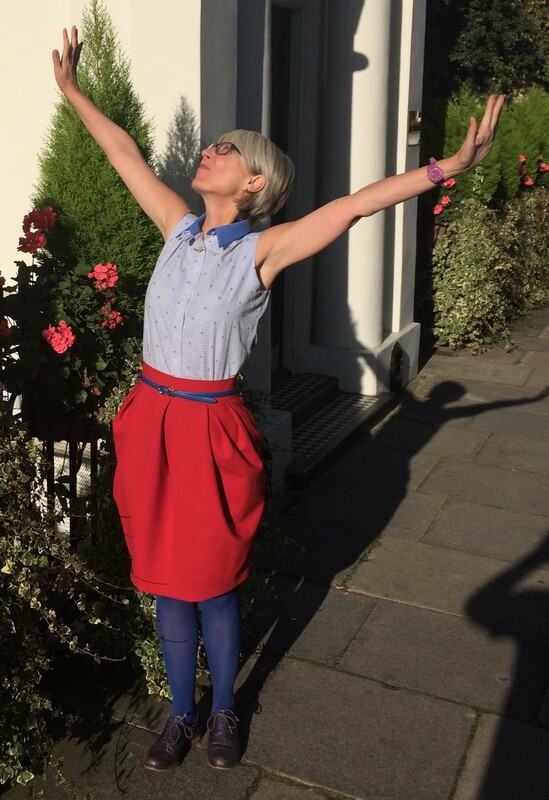 I’m fascinated with this skirt, and it’s much clearer now – thanks for the follow up. I’m in agreement with Jay above, having the straight grain at the back might control unnecessary stretching. I wasn’t sure if this shape would work on you, but it seems just right, especially keeping the fullness to the front. If I made this for myself , I can imagine moving the pleats and folds more to the side, to give the illusion of more curves! I’m really enjoying these posts. It has all started to become clear now! What an explorer you are! But I ask–how easy is it to walk? You have got there very quickly Lynn. One of the skirts is as slim as I dared go – the other is quite voluminous – comfortable but a bit extreme looking. I am making them both up so I will be able to tell you how they are to wear. Your skirt is lovely. It is generous of you to write such a good tutorial . Thank you for your posts on this process, this one in particular makes it seem much clearer.